In the recent white supremacist gathering in Charlottesville, chants of “Blood and Soil” were heard coming from some members of the marchers of a tiki torch procession. This chant was interspersed with chants of “You will not replace us.” When I read about this, I was stuck by the irony that a group of white supremacists — all of whose ancestors are not native to this soil — would be chanting about being autochthonous. I mean, the whole point of the two groups that most closely identify with the Blood and Soil language (in their web presences and poster/flyer campaigns), Identity Europa and Vanguard America, is the emphasis on their European (not American) descent. They aren’t even trying to claim to be indigenous to the US, and yet are invoking an ideology that is explicitly about being native to one’s land and thereby a part of it. If you are confused, that’s ok. It doesn’t make much sense at first. But what these supremacists are appealing to when they chant or put up posters or name their websites “Blood and Soil” is meant to align them with and appropriate for themselves an ideological position that links them both to the Nazi tradition in Germany and to Classical Athens, whose imagery and ideas they sometimes use in their advertisements. Let’s start at the beginning…What is “Blood and Soil”? Blood and Soil, or Blut und Boden, was an ideology that focused on two aspects of German identity — genealogy/descent and territory/land. Although most closely associated with the Nazis, it actually preceded them in Germany and has clear roots in 19th century German Romantic nationalism and racialism, but it picked up adherents after WWI. Like many nationalists before them, National Socialists wanted all Germans to be united as part of the new Reich, a perfect union of ethnic nationhood and state formation. Embedded within the idea was not just a unity of blood, but also a superiority of blood, an idea that German blood was purer than other blood. Where might Hitler and the earlier Blood and Soil adherents have gotten the idea that German blood was so wonderful? Sadly, a key source was probably the Roman author Tacitus, who, in his zeal to moralize about Rome’s own decline under the emperor Domitian (though things picked up, he suggested, under Nerva and Trajan) wrote an ethnography of Germans positioned as ideal Romans. Tacitus (58–120 CE) once wrote a book called Germania. This book, part of a long ethnographic tradition among the ancient Greeks and Romans, presents the German peoples to a Roman audience. The Germans had been a bit of a thorn in the side of Rome for a couple of centuries at the time he wrote about them, though it seems that both he and other Roman authors also admired the Germans. They were represented as both uncivilized and idealized — a true “noble savage” uncorrupted by the debaucheries of Rome. You have to wonder if Tacitus, knowing how this paragraph would be used centuries later, would have considered changing it or deleting it altogether. Alas, the paragraph is there and from the re-discovery of the Germania in the Renaissance until now, Tacitus’ comment on the indigenous and pure status of the German peoples and their connection to their homeland has wreaked havoc on history. …infected by no marriages with other nations and exist as an individual and pure race which is similar only to itself. It is because of this that the build of their bodies is the same in all the people, even though the population is so large. They have fierce blue eyes, red hair (rutilae comae), huge bodies, and they are strong only on impulse. 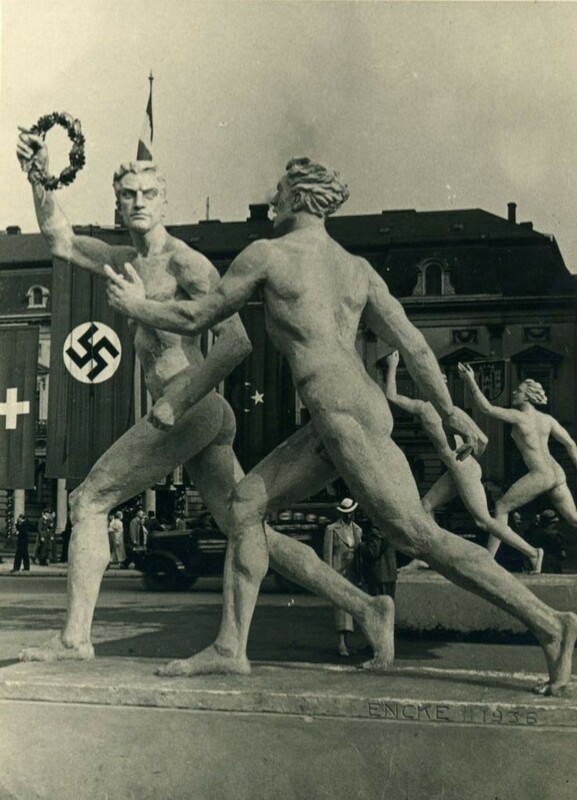 The Nazis would ensure that this is how Germans would look again (with a little “Aryan” twist — with blond hair instead of red — perhaps all those white marble sculptures fetishized by 19th century Germans encouraged them). Nazi policy called for the enforcement of racial boundaries, of a purification of stock, of a weeding of the less perfect and impure. They had to be removed from German land, eradicated. SOIL: One of the things you may have noticed in the Tacitus quoted above is the connection Tacitus makes between the Germans and their homeland — it is a climate and landscape only a native could love. This isn’t the only reference to the connection between Germans and their land. According to Tacitus, and in line with environmental determinism theories of the times, the land made the ancient German able “to endure hunger and cold” (Tac. Germ. 4). Tacitus flatters the Germans by pointing out their purity and relationship with the land, which enables it. For the Germans, the appeal of classical Athens was also present, and its sculpture specifically influenced them, displayed most obviously in Leni Riefenstahl’s Olympia. The long tradition of Classical Athens as an ideal in German Romanticism has been well-documented. But how deep did they go? The Athenians promoted the idea that they were autochthonous, which translates as “indigenous” or “born of the earth,” and passed laws aimed at ensuring that only those who were of “pure” Athenian birth would benefit from Athens’ wealth and power. I’ve detailed in an article in Eidolon how the Athenians’ obsession with their own purity manifested in practice and civic ideology. The ancient Athenians provided modern Germans with mechanisms and an ideology that would allow them to fortify and preserve the purity Tacitus sanctioned for them. The “Soil” portion of Nazi ideology of Blood and Soil was not just about the German homeland as a source of German strength and racial integrity. It was also as ideal way of life, that sat in opposition to cosmopolitanism — another opposition adopted by neo-Nazi’s and their sympathizers, and underscored policies of colonization outside Germany. Blut und Boden (an idea that, again, preceded the Nazis in Germany) was a German-specific type of environmental determinism premised on the notion that Germans were superior to other inferior peoples, in part because of their ties to their land — because of the relationship between the German people and their homeland (the “Soil”). Again, as Heineman comments, “The Germans’ mystical, and deeply virtuous, connection to the land contrasted with the rootlessness of those who had no such ties, notably diasporic and cosmopolitan Jews. Nevertheless, this ideology allowed for settler colonialism, or the implantation of Germans in soil to which they did not have a historically deep connection. As the German population expanded, it would need more Lebensraum, or living space. Otherwise the Volk might be compelled to curtail childbearing and lose its Darwinistic battle with other ‘races’.” Since the point was to expand the ethnically German population, not to extend German power over other “nations” (for example to exploit labor and extract resources), inhabitants of conquered lands would have to be removed and replaced by German settlers. Another component of this policy was a focus of the German “peasant” population — farmers and freeholders in the countryside were considered more German than those infected with urbanity and cosmopolitanism. Cosmopolitanism allowed for the “Germanizing” of foreigners (and of course threatened the “Judaization” of Germans), Lebensraum did not. We see hints of this in interpretations of ancient Athenian valorization of the hoplite as a citizen soldier who transitions from farmer to fighter, whose tie to the soil means he will fight that much harder for it. This so-called “hoplite ideology” has a long history of being represented as a citizen ideal and as a mark of the “traditional values” that allowed the Greeks (Athenians included) to enact the “Greek miracle.” In this way, too, German Romantic Nationalism’s elevation of Classical Athens set the stage for Nazi policies that acted upon the racist fixation on the intersection between purity of descent (Blood) and the homeland (Soil). After this little trip down knowledge lane, we can see why it might be confusing to have a bunch of Americans marching around chanting “Blood and Soil” for a land they aren’t indigenous to. But, the idea of Lebensraum and the Athenian concept of autochthony both came with hefty doses of superiority complexes that manifested in imperial ambitions that allowed for the Blood to become more important than the Soil, and so allowed for those of the right Blood to assimilate the Soil of others. The idea that this is exclusively Athenian or Nazi, however, is mistaken. The Nazi ideology was built upon a century or more of idealization of Athens by the German Romantics and, this idealization was not unique to Germany. Wherever Athens was held in esteem and a central component of elite education, ideas of “Manifest Destiny” exist. For these contemporary white supremacists, Manifest Destiny happened and it happened at the expense of “white, European blood,” blood that “soaked” the soil. That makes this land, in their twisted worldview, “theirs” — but only if one ignores all the African-Americans, Chinese, Mexican, Native Americans, or other of non-European descent whose blood was spilled in equal or larger amounts to make America what it has become. And that is where the irony comes in — for years they have believed in this fantasy, a fantasy promoted in our high school textbooks and TV and movies, that only “white” Americans participated in the building of our country. A fantasy crafted through the erasure of the contributions and oppressions of the participants in our nations history who were not of European descent. As that narrative is increasingly revealed as the lie it is, they cry “revisionism” and “changing history.” But it is the correcting of a lie, a lie that some people have been raised to believe is true — like the Tooth Fairy, only far more insidious. Blood and Soil and Confederate monuments are myths, so it’s just a wee bit ironic that they march under their banners as if they were true. Krebs, C. “A dangerous book: the reception of Tacitus’ Germania.” In The Cambridge Companion to Tacitus, edited by A. Woodman, 280–99. Cambridge: Cambridge University Press, 2009. For more information on the study of race and ethnicity in antiquity, visit The Bibliography @ Classics at the Intersections.